Brian French's really terrific website is just fascinating -- I could browse there for hours. 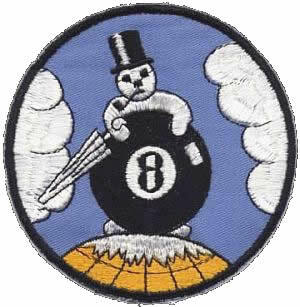 The patch shown above is from the 8th Weather Squadron of the Army Air Force. Hello to Tom and his visitors. This post is in regards to my Squadron Patch website listed above. It used to be hosted on COX, but they have stopped hosting websites. I have moved my website to a new domain. Thanks for the compliments re: my website. *** If you have a WWII Squadron patch that you would like to have identified, please follow the link below for the procedure to get it listed here. I have a WW 2 A2 flight jacket in my collection with this patch on front , painted US Air Force patch painted on left shoulder. Pilot was Ken R. Avery. Have photo of Maj Avery standing next to B-17 but I don't have particulars of when he served with this unit. Hello ,Brians site is Great,love to see "color" emblems shown,many are "Unofficial" which you won't find in the regular unit history books, I also am a emblem researcher,I do emblem ID's,anyne having 'Unknown" WW2 Avation patch/es need help e mail me I do ID work no charge. Changed the links so they work now. Thanks!! Hello, Thanks for the link to my Squadron Patches of WWII website. It has moved however and your current link is dead. I have an extra patch of the Eighth Weather Squadron. I have had it for over sixty years so I know it is the real thing.